Andy Slaughter is Labour MP for Hammersmith. After a fire caused by a faulty Whirlpool tumble dryer damaged 26 flats in a block in his constituency, he’s calling on the government to urge the manufacturer to change its safety advice and issue a full product recall. On 19 August, a fire broke out in a flat on the seventh floor of a high-rise block in Shepherds Court, Shepherds Bush, which is in my constituency. The fire was caused by a faulty Whirlpool tumble dryer, and quickly spread throughout the building, causing damage to 26 flats across five floors. Up to 120 fire fighters attended the scene to put out the blaze. The owner of the tumble dryer, Mrs Defreitas, was aware the machine was faulty and had followed Whirlpool’s safety advice to be present in the property and awake when the dryer was operating. Despite this, a fire broke out and destroyed her home. Thankfully, the fire only caused a few minor injuries, with no loss of life. However, it could have been much worse. There are approximately five million faulty Whirlpool tumble dryers in Britain. Over 120 models of dryer manufactured by Indesit, Swan, Creda and other lesser-known brands between 2004 and 2015 all share the same fault, whereby fluff gets trapped in the lint filter, overheats and can catch fire. According to Whirlpool figures, approximately one million of these machines are believed to be out of use, while 1.4 million were registered and have now been replaced or repaired. That means there are around 2.9 million unregistered Whirlpool tumble dryers that are yet to be modified. This is an enormous number of tumble dryers that pose a risk to life and property, and will do so as long as they continue to operate unmodified. Since the Shepherds Bush fire, I have been calling on Whirlpool to change its safety advice to customers, as recommended by the London Fire Brigade, which advises consumers to unplug and cease using the machines with immediate effect. I would also like Whirlpool to implement a full product recall, rather than merely replacing or modifying the faulty dryers. I have raised this issue on several occasions in the House of Commons, including in an Adjournment Debate I led on 13 September. The debate received cross-party support, but the response from the government was less than satisfactory. As a result, I have since met with the Minister for Small Business, Consumers and Corporate Responsibility, Margot James MP, to discuss the issue. Unfortunately, the government has so far failed to accept the severity of the risk posed by these faulty tumble dryers, so Whirlpool continues to avoid having to take any further action to rectify the situation. This is incredibly disappointing, given how potentially dangerous these machines can be. However, I will continue to work closely with Which?, the London Fire Brigade, my colleagues and consumers, to force Whirlpool to listen to our concerns and ensure that no further damage occurs as a result of its faulty dryers. I have also launched a petition calling on the government to urge Whirlpool to change its safety advice to consumers and implement a full product recall. If you would like to sign the petition, you can do so here. This is a guest contribution by Andy Slaughter MP. All views expressed here are Andy’s own, not necessarily those shared by Which?. What do you think of Andy’s suggestion for a full product recall of faulty Whirlpool tumble dryers? What would you like to see be done about the issue? What are my rights if I have a Whirlpool tumble dryer? The manufacturers were evidently very aware of the fire risks attached to their tumble dryers at the point of sale. This is a excellent example of manufacturers using loopholes, exonerating them from the responsibilty of producing goods that are clearly not fit for purpose and the control Big Business has over UK trading directives. I doubt that Indesit were aware of the fire risk as far back as 2005. If they were then they should be prosecuted. I would like to know when the particular problem with Indesit dryers was first brought to light, what the design or material problem is that makes them so susceptible to fire and whether they pass the BS EN safety test. That would be useful for Andy to investigate. There does not seem to have been much urgency about rectifying this situation by anyone involved, does there? Criticism should be directed at Peterborough Trading Standards who seem to have been totally ineffective in dealing with Whirlpool, allowing them to set up a snails-pace programme with no thought for the consumers they are supposed to represent. Were we in the USA, I expect Whirlpool would have been forced to make large payments to recompense all customers and probably heavily fined for their desultory handing of this. However I have some (little) sympathy for them in that they inherited this huge problem when they bought Indesit. I wonder what investigation is being made of Indesit’s behaviour in bringing )this situation about by what seems a poor (or even defective design? Dryer fires are nothing new, they happen all the time on all brands. Look at the figures, often they will not break down what brands or the percentage of each brand that suffers from a fire nor will they tell you why they went on fire. Even these ones, you see the big splash in the media about a fire but, you never seem to see the results of the investigation and why it went on fire. I’ll give you a clue though… there’s hardly any flammable material in a tumble dryer. Discovering the cause of a fire can be difficult because a serious fire will destroy the evidence. There may be little flammable material in the components of a tumble dryer but when in use, the fabrics in the load will be flammable once dry and it is well established that accumulation of lint is a fire risk. Instructions booklets often warn of the risk of fire if lint filters are not cleaned. I am concerned that manufacturers of domestic tumble dryers have not included some form of interlock that requires the user to clean the filter before a cycle can be started. This would not be technically difficult or expensive. With mains-powered electrical appliances there is always going to be a small risk of component failure and fire, but an all-metal case could contain a fire, at least in a condenser dryer. When the oxygen was used up the fire would go out. There are many photos showing that plastics used in control panels and case tops do not survive fires. 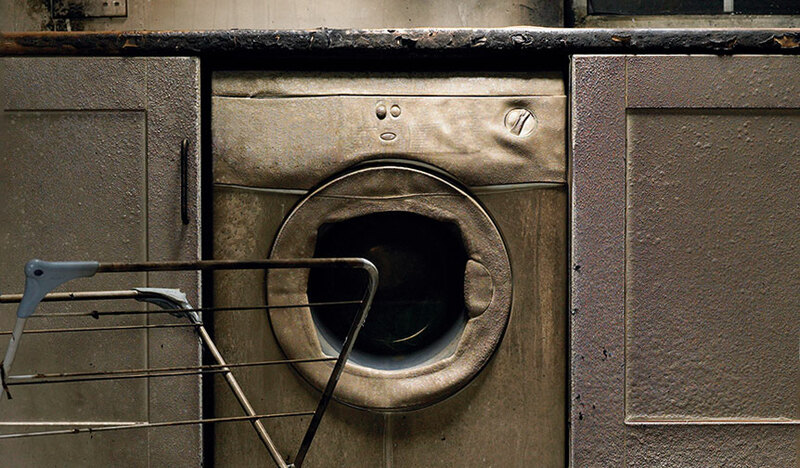 Whirlpool has warned of the fire risk associated with certain models of tumble dryers but perhaps this is an opportunity of looking at the design of dryers and other appliances with a view to improving safety standards. As far as I can see the plastic components here are pretty well intact and show little deformation. I do not know what contribution blocked lint filters make to the possibility of a fire, but it seems clear that something about the Indesit design is causing a problem. Instead of speculating we should be looking at exactly what the problem might be and how it can be dealt with in future, probably by incorporating the lessons in the safety standard so all tumble dryer manufacturers can avoid the problem in future. I would be surprised if some organisation has not looked in detail at this, and done tests. Presumably Whirlpool will have to have come up with their modifications. The information should be made public. I have asked Which? if they would do tests on Indesit dryers to see whether they comply with the safety standard. It seems to me Which? should be providing “action” as well as words (a lot of them since this problem first arose). Is it Which?’s job? No. It should be for someone like trading standards to do this and look after consumers safety. Citizens Advice are not equipped to do this on their behalf, I imagine. It seemed to me that the fire that caused the damage shown in the picture must have been extinguished quite soon after it started since the paintwork on the cabinet doors either side of the machine has only bubbled up and there is no apparent burning of the carcases. There is also little evidence of progressive development of the fire as all the fire damage is to a consistent extent as if an accelerant had been sprayed across the scene, set alight, and then rapidly put out. I would suggest it is not a proper illustration of the effect of a fire emanating within a tumble drier and that in a real experience, after a few minutes, there would be considerable deformation and destruction of any plastic on the machine and laminates on adjacent surfaces, and then extensive burning of chipboard and wooden panelling giving rise to intense and hazardous smoke. Any nearly-dry fabric material inside the machine would have soon caught fire and burned. That nobody has been killed yet is a miracle. It seems strange that the Health & Safety Executive appear not to have been involved so far. Manufacturers H&S obligations do not expire at the factory gate. In fact, one is tempted to ask why are so many bodies that should be taking a professional interest in this apparently running away or sitting on their hands? 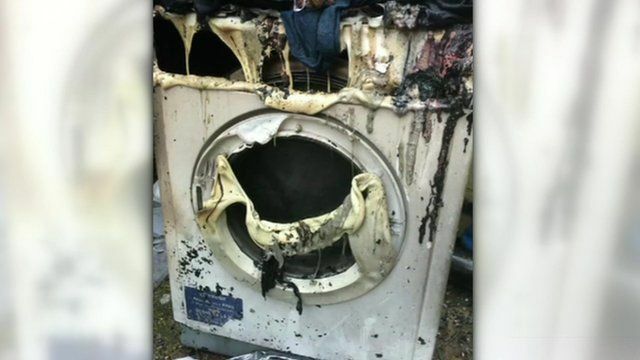 A Google search for “tumble dryer fire” will show other examples and it is worth looking at other appliances too. Have a look at the photos and decide whether plastics are a good choice of material for the casing of tumble dryers. The Whirlpool problem provides an excellent opportunity to look at the safety of tumble dryers and other appliances. As John says, manufacturers have a responsibility for safety. Fortunately, the family’s home survived because the dryer was in the garage. The video shows that the top and control panel are missing and the door has gone. Had the panels and the door been made of metal, the fire could have been contained. I suggest that readers take a magnet and check the casing of their appliances – especially the top panel and control panel (fascia) – to see if it is all-steel or plastic has been used. Plastic need not be a problem provided that there is metal behind. We have the opportunity to make household products safer. I would like Which? to push for British Standards to require all appliances to be able to contain fires should they start for any reason. I have always believed that misuse of domestic appliances was a significant background cause of catastrophic incidents but there are also likely to be design flaws that either enable or do not prevent such occurrences. It is a pity that investigation reports do not seem to come into the public realm as they would help us discuss the problems on the basis of facts [or at least scientific deductions] rather than assumptions. Do you think Which? could have conducted tests? And should of? Yes I do, Patrick. I think a major disadvantage in trying to deal with the Indesit [etc] problem has been the lack of knowledge of (1) what has been happening inside the machines, and (2) how it appears that, for some machines, a simple modification appears to be all that is required to make them safe. If Which?, or a Trading Standards authority, or a safety organisation, had carried out a thorough investigation a year ago on tumble driers from the affected batches that had and had not caught fire we might some time ago have got to the root of the problem. I think this vacuum in official intervention has enabled Whirlpool to carry on in its own way without disclosing the facts about the problem. Somewhere, within the company and within the ex-Indesit management, there are people who either knew about the risks and did nothing about them, or alternatively should have known about them, and in both cases are therefore culpable. I support everything that Andy Slaughter, MP has said and certainly think there should have been an official recall. Perhaps the criteria for determining when a recall is justified or mandatory need to be reviewed. 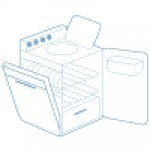 We don’t know what information is held by Indesit/Whirlpool. Commercial organisations are exempted from Freedom of Information enquiries. Legislation that denies the public information that companies hold about safety issues and accident reports is very wrong, in my opinion. My view is that companies should not make decisions about whether products should be recalled or warnings given. They stand to lose a lot of money if they do issue a large recall and there is obviously a danger that this might be delayed. The authorities will have the means to investigate private companies. i don’t see why it is necessary for individuals, and competitors, to be able to access commercially sensitive information. Ask the relevant authorities to do it on our behalf. I would hope that either Trading Standards, BEIS, or other appropriate public bodies will do this. it is part of what we pay them to do. I don’t have your confidence, Malcolm. You could equally say that Trading Standards should deal with valid complaints from individuals regarding regarding safety issues but that does not always happen. I don’t want to live in a world where companies can withhold information about products that could be dangerous, just because it is regarded as ‘commercially sensitive’. Trading standards should deal with individuals’ valid complaints. We have authorities to deal with companies on various grounds including dangerous products and they should do that job. We, Which?, and others can make complaints to those authorities and if they look significant or serious expect them to follow them up. I have not suggested that companies can withhold information that is about dangerous products – quite the opposite. It is simply who can demand that information. If the authorities and consumer organisations do their jobs properly they should do the necessary work to protect the public. Yes Trading Standards should deal with our complaints and that is something that we can all agree with. Until the authorities and consumer organisations have demonstrated that they are investigating dangerous products in a timely fashion, I believe the public should not assume anything. Having discovered that my Bosch, Hotpoint and Miele appliances all have flammable plastics in their casings, I don’t have a great deal of trust in their ability to contain any fire that started. I would like to ask the same questions off all manufacturers and not just these ones. I think the benefit of a public right of access to certain safety-critical information is that it enables the media to probe and follow-up news articles, readers’ letters, and ‘Watchdog’ complaints by obtaining data and other details from companies. If necessary there can be a ‘commercially confidential’ defence that could be examined by a judge or tribunal. The important thing is that there should be no hiding place for information that relates to the safety performance of consumer goods, and nor for the people who conceal or withhold such information. Routine industrial espionage, trade get-togethers and the internet mean that there are very few commercial secrets these days. Manufacturers of rival products are selling them through the same retailers so it would be impossible to have complete confidentiality about critical components. Any consumer body such as Which? can buy appliances and other products, strip them down, and examine them – so why should there not be freedom of access to all relevant product information? The difficult part of this is how society deals with questions like “Who knew what and when?” because that is, rightly, a confidential personnel matter where employees [at every level] have rights too. I totally agree, John. Commercial confidentiality allows manufacturers to avoid giving the amounts of hazardous chemicals in products – take bleach as an example. When treating people who have ingested poisonous substances it is useful to have as much information as possible. It’s very easy to measure the concentration of sodium hypochlorite in bleach. Nowadays, it’s very easy to chemically analyse competitors’ products and duplicate electronic and mechanical assemblies (reverse engineering). I do NOT wish to interfere with commercial activities unless there are hazards involved or a company acts in some way against the interests of the public. It is as your example, for instance, that this may not be effective. I would expect safety issues to be dealt with by the “authorities” as the consequences of defective products appear in public. What the authorities should also be doing is finding why the problem arose, if someone was responsible, whether something illegal was afoot. The press can access alleged misdemeanours through their own dubious and devious methods, although the quality of objective reporting these days suggests they would be more likely to seek headlines than a real balanced report. We should also support “whistleblowers” with confidentiality and anonymity to help uncover problems, whether in public or private organisations. But I cannot see how a mass of individuals given the power to demand information from business can help; what do they then do with that information?. As part of the business, perhaps shareholders should have this entitlement? I believe the best way forward is to ensure that we support properly those organisations we set up to act on our behalf. Trading Standards as a starter. We should certainly push for safety issues to be dealt with in a timely fashion by the authorities, but there is plenty of evidence that this is not happening. This Conversation relates to one of them. Authorities cannot deal with problems until they are aware of them. Earlier, you said: “I doubt that Indesit were aware of the fire risk as far back as 2005.” You don’t know and neither do I. If the company had to report safety issues at the earliest opportunity, some people might not have lost their homes in fires. Not many are up to being a whistleblower. They could lose their job, or worse. There is no case for confidentiality where safety is involved. I said “I doubt” because I don’t know. However, I would hope someone would investigate this properly. The point about “whistleblowers” being properly supported would mean, by confidentiality and anonymity. their job should not be at risk – the whole point. It would not preclude disaffected employees from making unfounded or malicious allegations, and this is what we must guard against. In this dryer issue it seems to me no one has done anything effective in a timely way. There has been a lot of hot air, and that’s about all. So, our goods have been replaced. Should they provide a receipt for this and does the guarantee restart from the date the goods were replaced? And, what if the replacement product also fails? I assume that if you pay for your replacement – although at a discount – it is like buying a new machine with a normal guarantee and protection under the Consumer Rights Act. Had the replacement machine been a straight swap, the original guarantee period would not normally be extended. Buying a new machine at a discount prices would, I expect, be a separate contract, a receipt given, and the normal guarantee period would apply. It could be more complicated if the dryer had been covered by an extended warranty. I would be surprised if this was transferrable to a replacement machine. It’s always worth checking the terms & conditions. Normally an extended warranty “pays out” when the machine it covered is replaced should that be the only solution. The warranty then terminates as it has done what you paid for; if you want the new machine covered then another warranty would need to be purchased. As I understand it. You can buy warranties to cover multiple machines – it would be useful if Which? did a report on these to see if any of them are worthwhile. 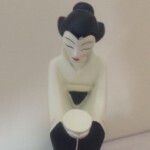 Under normal circumstances I would put the money they might cost into premium bonds and withdraw it if you need a repair – never know, you might also have a bit of luck. I’ve re-read the title to this Convo – “Andy Slaughter MP: ‘I want Whirlpool to implement a full product recall’. ” What exactly would this achieve? The removal of potentially hazardous appliances from people’s homes with compensation to enable them to have an equivalent replacement, I would have thought – in other words to put the owners in the position they would have been in if their machines had been fit for purpose and safe to use. Exactly, but no one knows exactly who has got them, so MPs need to get stuck in to setting up a proper recall system. Whirlpool should be made to compensate all owners of unsafe appliances so they can either buy a safe Whirlpool dryer or one from someone else. Simply issuing a “recall” will not move us much further on. They have been talking now for 14 months and where are we? It is time for action, not hot air. Whirlpool are presumably well set up financially, so should be able to pay a large fine to the UK Govt. as retribution for their inaction and to help fund the recall system. The Americans seem very good at fining UK institutions; perhaps a reciprocal arrangement is called for? I agree with you Malcolm. I think that as soon as it was publicised that any applicable Indesit/Hotpoint/Creda [etc] machine without the green spot would be replaced [with cash or an equivalent dryer] the unknown machines would rapidly be declared. Landlords would have to be put under an obligation to have those in their properties checked. At present a number of ‘at risk’ machines go unrecorded because the owners have no certainty of whether anything will be done and over what timescale. If necessary the government should issue a card to every household with a warning and an explanation of the resolution arrangements [ultimately at Whirlpool’s expense, of course]. If necessary veterans of the Royal Corps of Military Administrators need to be pressed into service to get it sorted at the double.